Beauty & All That: March Ipsy Bag revealed! 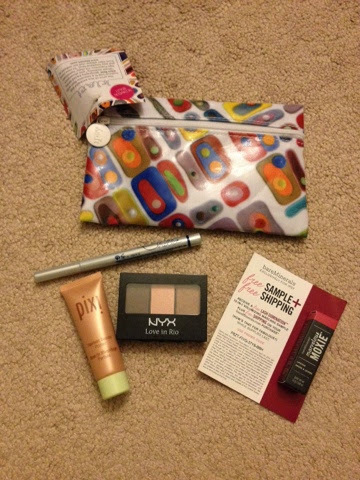 March's Ipsy bag (http://www.ipsy.com/?refer=u-hkd1iykrlf0y7y3) includes eyes, lips and face products that are perfect for travel and for an everyday look. The bag came with the cutest travel-sized lipstick from bareMinerals. The Marvelous Moxie lipstick in "Get Ready" is a pretty pinkish red. It's also quite hydrating and perfect for everyday. For an everyday, easy to wear eye makeup, the NYX trio offers complimenting shades for many eye colors. Dare to go blue? The Chella eyeliner lets you get the perfect winged look with its precise liner. To get your face prime and ready to go out, the Pixi Beauty primer helps you get that glow! I don't normally use primers but it's got some tint and I like the radiance it brings out in my skin.